Janet has shared her tips for removing water stains, spots and rings from wood. Have you ever dribbled water on some of your wooden furniture like a coffee table, end table or even on your kitchen cabinets? This happened to our cabinets and it left some white water spots that wouldn't go away. It looked just terrible so I had the idea that if I applied some mineral oil to a soft cloth and went over the water spots on the cabinets that it would go away. Well it worked very well and my husband was very pleased because he was ready to have the kitchen cabinets redone. 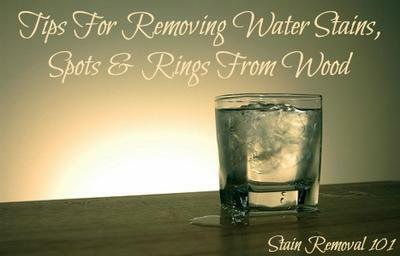 Thanks so much for sharing your tip for removing water stains on wood furniture, especially when it is such a nice simple idea. Those are the best! Does anyone else have any tips for removing water spots and rings on wood? If so, you can share your tip here, or read others that have already been submitted. In addition, did you know there are lots of mineral oil uses around your home? It is actually a great thing to keep around your home. You can find out even more uses for mineral oil here, or read more that are already on the site! My secret is easy and inexpensive and it worked. All you do is get an iron and an old tee shirt. Put the iron on medium high heat, put the tee shirt over the stain and apply the hot iron and go back and forth a few times. This works for me!! Vaseline or toothpaste also get them out if not a bicarb paste does. Even old ones with no damage to the wood. Join in and write your own page! It's easy to do. How? Simply click here to return to water stains on wood floors.